Paiste’s almost forensic attention to detail is all over these new Masters additions. The Dark crash ride is a big, ebullient, general purpose cymbal while the Dry and Extra Dry rides offer both mainstream and more off-the-beaten-track players a truly individual voice. It’s become something of a custom for Paiste to use the prestigious NAMM trade fair that begins each year to drop a selection of brand new models. 2018’s show was no exception with a cluster of new cymbals from various Paiste ranges being unveiled. As ever with Paiste, there is never any pre-publicity or spoiler alerts - everything lands on launch day. 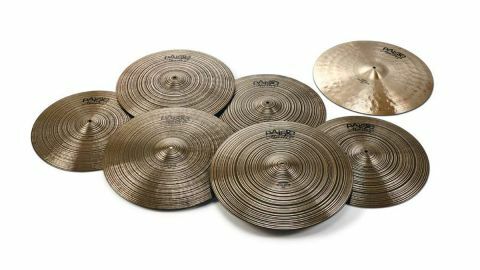 Up for review here is the first batch of this season’s Swiss debutants, which are all additions to Paiste’s high-end Masters series, namely a 22" Dark crash ride and six Dry and Extra Dry rides (three of each in 20"/21"/22" diameters). Paiste Masters began life in 2011 and initially consisted of 12 rides, many of which were inspired by requests from Paiste endorsees. The range has slowly evolved to include hi-hats, crashes, splashes and a single Swish, with the emphasis remaining on musicality and versatility. Individually cast from CuSn20 - which is Paiste-speak for B20 bronze - Masters cymbals are hand worked throughout every stage of the manufacturing process. Though Paiste is packed with long-serving employees, only the most experienced cymbalsmiths get to work on Masters models. The 22" Dark crash ride is a companion to the existing 20" model. Several prototypes were made and after being appraised by Paiste artists the final design was settled on. Like it’s smaller sibling the 22" is liberally cratered with deep hammer marks, which catch the light from any direction. In contrast, the Dry and Extra Dry rides present an altogether more muted appearance. This is due to a matt finish, which is banded on top of and covers the entire underside of each cymbal. It is confident that the new rides will keep their dryness no matter how much stick action they see. While the two models are hammered differently, due to the thickness of the finish the hammer patterns are easier to discern on the Dry rides. First out of the box is the 22" Dark crash ride; at the best part of 2.5kg it’s a hefty slab of bronze. The darkness of the note is evident and, played gently, it reveals a buttery stick sound sitting over a lush blanket of warmth. At this volume the wash plays a conventional supporting role; upping the velocity finds it chasing and then catching the pulse as the cymbal begins to open up and slide towards crash territory. Notching things higher brings it to a rolling boil of wash through which accents and nuances can still be punctuated - like the sort of churning wave of cymbal froth that Keith Moon made his own. A full-on crash drenches everything and is guaranteed to have any six and four-string colleagues giving you sharp sideways looks whilst fumbling with the volume pot on their amps. It has enough subtlety to thrive at the more dynamic end of jazz but we wouldn’t take it on a piano trio gig; it’s a lively cymbal suitable for many other genres and will do whatever you ask of it. The Dry and Extra Dry rides are, unsurprisingly, different kettles of fish altogether. As well as being virtually indistinguishable in weight, each diameter of Dry/Extra Dry ride is remarkably similar in tuning and pitch; they only differ substantially in their level of dryness. The Dry rides are definitely in the dry zone and give a clear, articulate stick sound over a controlled and respectful wash. Patterns are reproduced with watchmaker accuracy while a delicate shimmer builds behind. Playing the bells reveals a harder edge and a few more harmonics while crashing brings an earthy bloom. Going upwards in the diameters brings a lowering of overall pitch but the characteristics remain the same. Switching to the Extra Dry rides, the depth of dryness is quite profound; they are bone dry and give an even more pronounced stick sound over a wash that’s so minimal it lies somewhere between strangled and nonexistent. The purity of note is extraordinary and the absence of any discernible overtone (even sympathetic) is almost shocking on first hearing. These are properly dry cymbals - drier than a guitarist’s bathmat - that really do stand out from the crowd.